Acquisitions: The New Brooks Saddle Stand! My new (to me) 1968 Raleigh folding bike...with my Brooks saddle installed. Bringing this baby back to Brooklyn wasn't an easy task! But he sure is cute. What was even cuter was when I parked him outside Roebling Tea Room on Saturday and someone with a perfectly matching 10-speed version sidled that puppy right up along side. Same paint, same stickers. Was like witnessing a mother-child reunion. Meanwhile, seeing me ride this one is unfortunately shaping up to be a bit like witnessing a clown act. I've gotten, "This is for YOU?" from the guy who sold it to me and "Yes, this seems too small for you" from the man who put on my seat. Oh, well. It looks just perfect sitting in the apartment! 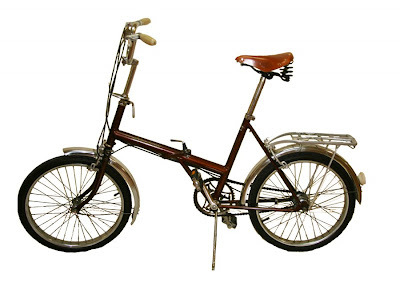 Ah, I have a '71 Raleigh "Twenty" folder with a sprung Brooks saddle. It's my bicycle for traveling in gentleman's attire. It gets a lot of smiles.